Cash Registers There are 10 products. The Casio SE-C450 cash register is a fantastic machine for any retail/business environment. Includes FREE programming, till rolls and delivery! This cash register is brand new and comes set-up and ready to use out of the box. It comes complete with instructions, a simple easy-to-use instruction sheet and 5 till rolls. 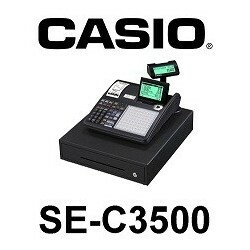 The Casio SE-C3500 cash register is a fantastic machine for any retail/business environment. Includes FREE programming, till rolls and delivery! This cash register is brand new and comes set-up and ready to use out of the box. It comes complete with instructions, a simple easy-to-use instruction sheet and 5 till rolls. The Casio SE-S10 cash register is a fantastic machine for any retail/business environment. Includes FREE programming, till rolls and delivery! This cash register is brand new and comes set-up and ready to use out of the box. It comes complete with instructions, a simple easy-to-use instruction sheet and 5 till rolls. The Casio SE-S400 cash register is a fantastic machine for any retail/business environment. Includes FREE programming, till rolls and delivery! This cash register is brand new and comes set-up and ready to use out of the box. It comes complete with instructions, a simple easy-to-use instruction sheet and 5 till rolls. The Casio SE-S3000 cash register is a fantastic machine for any retail/business environment. Includes FREE programming, till rolls and delivery! This cash register is brand new and comes set-up and ready to use out of the box. It comes complete with instructions, a simple easy-to-use instruction sheet and 5 till rolls. This listing is for 4 magnetic iButton Dallas Keys (choice of 4 colours). The iButton Dallas Keys are brand new and sent via Royal Mail 1st Class. This listing is for 1 magnetic iButton Dallas Key (choice of 4 colours). The iButton Dallas Key is brand new and sent via Royal Mail 1st Class. 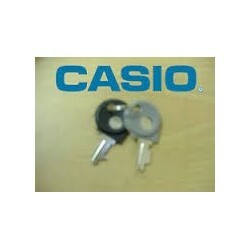 Keys for Casio SE-G1, pack includes 1 x Black Key, 1 x Grey Key and 1 x Cash Drawer Key.